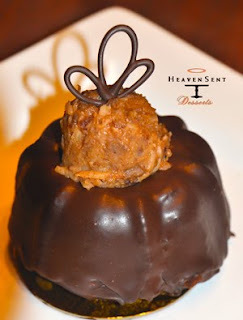 30th Street Blog: Heaven Sent Desserts are simply - heavenly! Each 30th we serve a different special from our menu at a special price and this 30th on 30th Heaven Sent Desserts offers up an individual Spiced German Chocolate Bundt Cakes. Whether you are a choc-a-holic or a bundt cake aficionado, or simply love desserts, this individual Spiced German Chocolate Bundt Cake will wow you with its rich tasting experience. The Devil's Food chocolate base is rich, moist, yet light; with an interior of Coconut Pecan filling, finished in a smooth and silky chocolate covering - both filling and covering spiced with cinnamon and cayenne pepper. This delectable dessert is especially priced at $3.50 for the 30th only!